No, this blog post is not about a get rich quick scheme, but there is a way for the average wheat farmer in the southern Great Plains to add $50,000 to $100,000 to the bottom line in a single day. Most soil tests I have pulled this summer have shown 50 to 90 lb/ac of NO3-N in the top 18 inches of soil. Ninety pounds of N equates to about $45 of N fertilizer, and this knowledge could save a 2,500 acre wheat farmer in excess of $100,000 in fertilizer cost. Soil testing is laborious, but the potential economic returns for spending a day or two soil sampling are outstanding. There is still time to soil sample. Soil samples only take a few days to process once they are in the OSU lab. It is not unusual for transit time to the lab to the slowest part of the process, so if you need a fast turnaround a trip to drop samples in the Ag Hall basement in Stillwater will help (plus you have probably been wanting cheese fries). If you have already applied pre-plant fertilizer or sown wheat, there is still time to assess soil N availability and uptake via the N-Rich Strip. In its simplest form, the N-rich strip is an area where N is not limiting. Either by visual assessment or with the assistance of an optical sensor, you can use the N-rich strip to determine your top dress N requirement, but you must create the N-rich strip this fall. 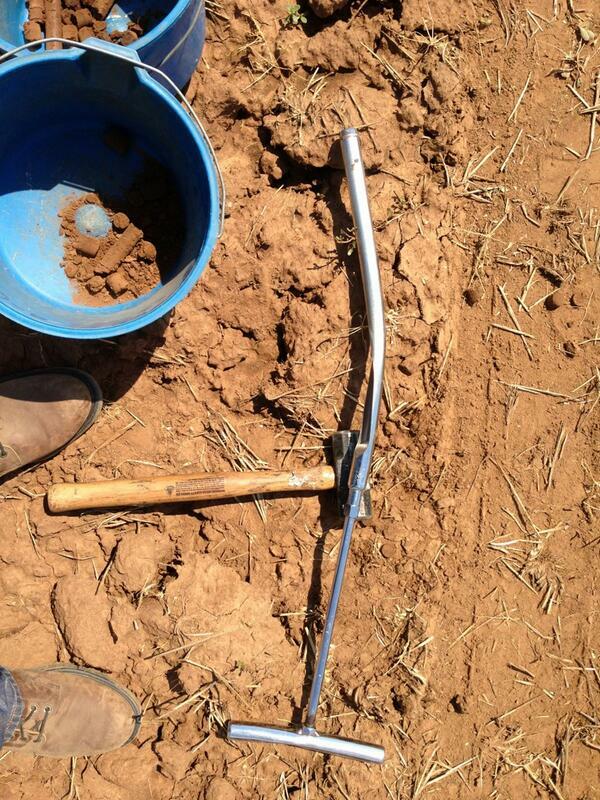 Soil testing is not always easy, but it is time well spent. My high school shop teacher would have labeled me a “Primitive Pete” for this photo. The bottom line is that a day of soil testing or putting out N-rich strips is well worth your time investment. On another note, how would you like to make money and improve your health at the same time? I have a multi-level marketing opportunity that I can get you in on the ground floor, but don’t tell anyone else. I can only make this deal for you and only today. There will be a small “buy in” fee that you will need to pay cash up front, though.